Late last March, we announced that we’d be collaborating with Obsidian Entertainment on technology. This primarily meant their conversation editing tools, which provide a very strong foundation for the dialogue reactivity we seek for Torment. We’ve been prototyping conversations with these tools since last summer and have been adapting the technology for Torment’s specific dialogue needs. 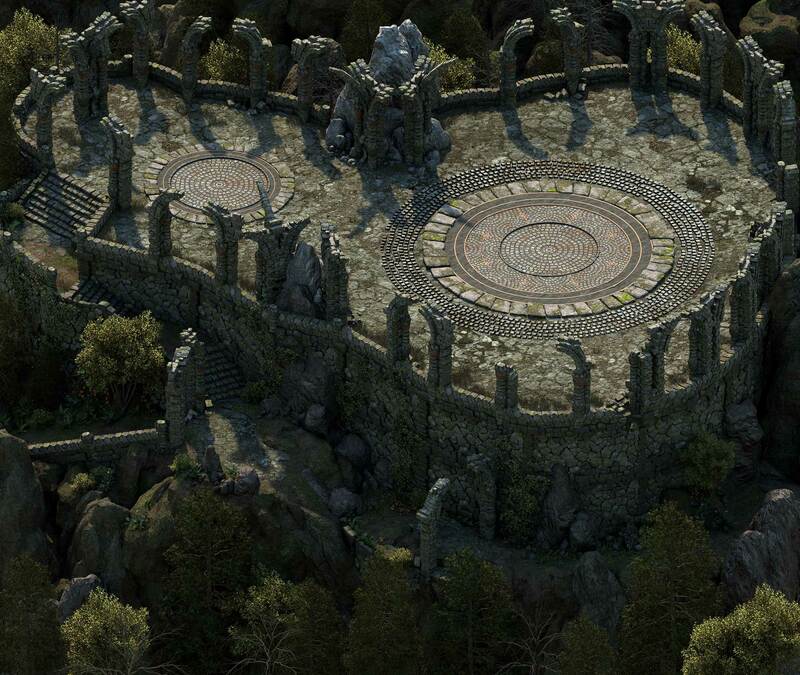 Meanwhile, we’ve been evaluating other aspects of the Pillars of Eternity technology over the last months and have been impressed with the environments they’ve been able to create with it in Unity. We seek a similar high level of quality for our environments in Torment. I’m happy to say that we’ve taken things a step further and recently reached an agreement to license Obsidian’s technology for Pillars of Eternity to use in Torment. (In case you haven’t seen it yet, a great Pillars of Eternity teaser came out last month – they are still accepting late pledges for any who missed their Kickstarter.) Torment’s code base will thus include the most relevant components of PE’s technology and Wasteland 2’s. We’re making enhancements to best suit Torment, and some systems will of course be completely new as Torment’s design is its own. What are the practical implications of our licensing PE technology? It provides us with a stronger starting point for certain game systems and pipelines, including the creation of the 2D pre-rendered environments (we’re working on having something to show you in the coming weeks). This means we will have more resources to invest on other aspects of the game, allowing us to achieve a higher quality overall. (Recall that 100% (and more) of the crowdfunded monies are allocated to development of Torment. So anything that saves effort means that we have more to spend elsewhere on Torment.) This arrangement benefits both games and we continue to push Torment as far as we can in terms of quality. Loot drops—whether from a dead NPC, a locked chest, or something else entirely—will be pseudo-randomly generated (though not purely random, and major, unique items will almost always be intentionally placed). Each of the above loot types has a weighted chance of appearing in a given drop based on a few things: how far you are in the game; what type of loot drop it is (more on that in a second); whether the drop is Poor, Average, or Rich; and other customizations from the area designer. The result will be balanced loot drops that feel right for the area or NPCs that dropped them, while keeping new playthroughs interesting with new or different items each time. There are also two different types of loot drops. Unlike most fantasy settings, Numenera's magic items (oddities, cyphers, and artifacts) aren't usually lying around in a treasure trove. They might be, but Numenera is about discovery, and often the player is actually scavenging and cobbling these things together himself. In Torment, we abstract that with two kinds of drops: Ninth World Loot Drops and Scavenged Loot Drops. Ninth World Loot Drops are the stuff that's just lying around for the player to pick up. It might be from an NPC's pack, locked in a chest, or bought from a merchant. The key criteria here is that someone in the Ninth World must have left it there. Scavenged Drops, on the other hand, are loot directly from the prior worlds, untouched by any Ninth Worlder. They might be parts you find in an old machine, or items scavenged from a pile of rubble that's millennia old. You won't find short swords and steel greaves in a scavenged drop. You'll always find the good stuff. But the good stuff isn't just sitting there waiting for you to use it. An explorer wouldn't find a gravity-nullifying suspensor belt just lying around in an old machine. Rather he'd grab an electromagnetic thingamabob that, when hooked to another doohicky, somehow nullifies gravity. Then he'd attach that to a piece of metal or leather—something that can serve as a belt—and voila: suspensor belt. The way we handle that in Torment is to make scavenging a Difficult Task (specifically, an Intellect-based task for which certain Lore skills apply). It's not a very difficult task—basic scavenging tasks will succeed 75% of the time, and a character who's trained in Lore, or who uses a little Effort, will succeed at basic scavenging tasks pretty much all the time. But there will be those rare, difficult scavenging tasks that require specialization, or a lot of Effort, and the player can decide (after seeing the item in the looting interface) whether it's worth the risk or not. Adam Heine sure does like his randomness.